We have the equipment that can detect water that has seeped into the cracks in the floor of your business and act fast with our services. Commercial water damage can halt your business until it is mitigated. Besides the visible effect on the building structure, there are also safety issues and the possibility of secondary damage such as mold if the moisture is not removed as quickly as possible. When SERVPRO performs commercial water removal in Columbia businesses, extraction is something we spend extra time doing because every bit of moisture removed beforehand, lessens the drying time and speeds the restoration process along. We know this is especially crucial for commercial properties involved in the retail and hospitality sector as they rely on foot traffic for a good portion of their revenue. For water removal in a small area, we have portable extractors. Large scale water spills are no match for our truck-mounted pumps that can pull thousands of gallons of water in short order. In properties that have carpeting, we have weighted and stand-on extractor units that use weight to push water out of the padding and assist the carpet in drying. Each of these extraction methods helps in reducing water loss. The other part of water removal occurs during the drying phase of restoration. Moisture lifted by the air movers during drying is disposed of using different types of dehumidifiers. Desiccant dehumidifiers are an effective way to remove excess moisture. A wheel coated with a substance such as a silica gel attracts the water vapor, and as it collects, the weight turns the wheel, and the water drops off into a disposal port, and the process begins again. Our SERVPRO technicians have a goal of getting your commercial property back to the business of serving customers as quickly as possible. 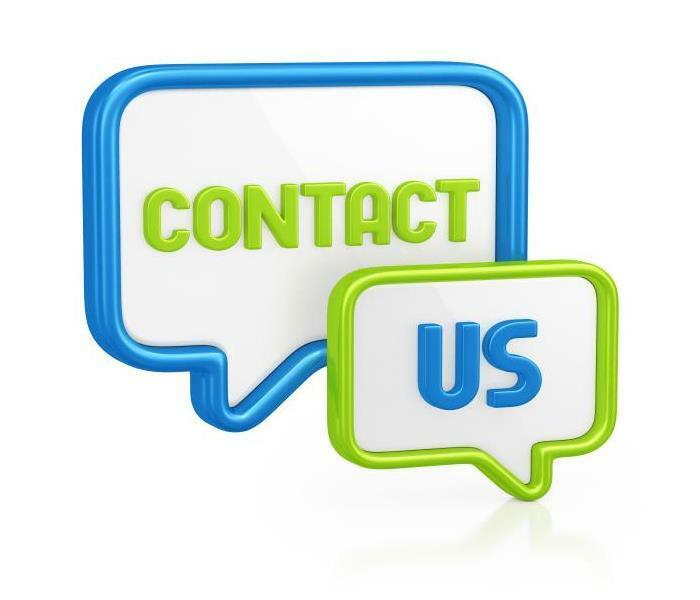 We communicate with you every step of the way to ensure you know what our technicians are doing throughout the restoration process. SERVPRO of Maury / Giles Counties is available 24-hours at (931) 388-4248 for commercial water removal. Our emergency response teams have the training and equipment to restore damage from your water loss and make it "Like it never even happened." Recycling is easy and more convenient than it has ever been, click here for more information. SERVPRO of Maury / Giles Counties can provide the kind of fast and professional care your home needs in the aftermath of a flood. One of the most severe potential risks after your home in Columbia sustains flood damage comes from the electrical lines, outlets, and appliances in your home. Electrocutions cause many of the most severe injuries that result from large storms, and SERVPRO technicians take numerous steps to protect themselves from the hazards that may lie around your home. The best way to protect yourself from potential dangers is to avoid them entirely, so be on the lookout for these signs of what may be a serious risk to your health. Any time you see water leaking from an electrical outlet, light source, or electronic appliance in your Columbia home after flood damage occurs, you should avoid touching or even being near the fixture in question. While all electrical fixtures may pose a hazard in such a situation, wet objects require extra caution and attention as they pose an even greater threat to your safety. If you notice any water leakage in and around an electrical outlet or appliance, be sure to let SERVPRO technicians know so that they can better protect themselves. Any part of your home that still has power in its appliances or lighting fixtures while still clearly being wet may pose more hazards than you might expect. Even if there are no apparent dangers in the area, unseen electrical damage may harm you through electricity conducted by wet structural materials in the area. SERVPRO technicians wear thick, insulated boots to protect themselves against these hazards. Sometimes, strong winds from a storm may cause other types of damage to your home, some of which may impact the electrical systems running throughout your home. Staying away from exposed wires (even if they do not appear to conduct electricity) should be a standard part of your safety plan after a disaster. SERVPRO of Maury / Giles Counties can provide the kind of fast and professional care your home needs in the aftermath of a flood. Call us for help 24/7 at (931) 388-4248. Call us after a fire we can purify your home after the smoke and soot settle. We have the equipment, experience and training. Your Columbia Home Smells like Smoke Thanks to Fire Damage! Most homeowners experience accidents in their home at some point or another. These disruptions of daily life are usually the result of smaller things, like a grease fire that starts in the kitchen and suddenly there are flames to put out and a need to call the fire department. Regardless of its source, the smoke and fire damage resulting from that small event can leave you at a loss when returning your home to normal. When your home in Columbia falls victim to fire damage, it is best to reach out to an expert team such as SERVPRO. Our technicians are IICRC-certified and receive continuous instruction on the latest techniques and equipment available for the restoration of homes such as yours. Most importantly, our team is available 24/7 to respond to your call and begin the time-sensitive task of removing any remains of the fire, including the subsequent damage firefighting agents may have caused. Based on our training and field experience, our SERVPRO team can observe the path of the smoke and soot to assess each surface and determine the best cleaning agent for it. Most importantly, our team can determine where the foul smoke smell resides and work accordingly to eliminate it from your home. If your air vents and ducts are spreading the smell throughout your home, we can install specialized filters and air purifying equipment to improve the air quality and return it to normal. Many times, homeowners attempt to restore their furniture and belongings themselves using store-bought solutions. Although these can be helpful for some things, you also risk worsening the damage if it is not the right solution for the surface you are treating. A professional team such as SERVPRO can make an educated decision for each affected area to optimize its cleaning efforts and minimize your damages. Click here to discover what your parks can offer you. 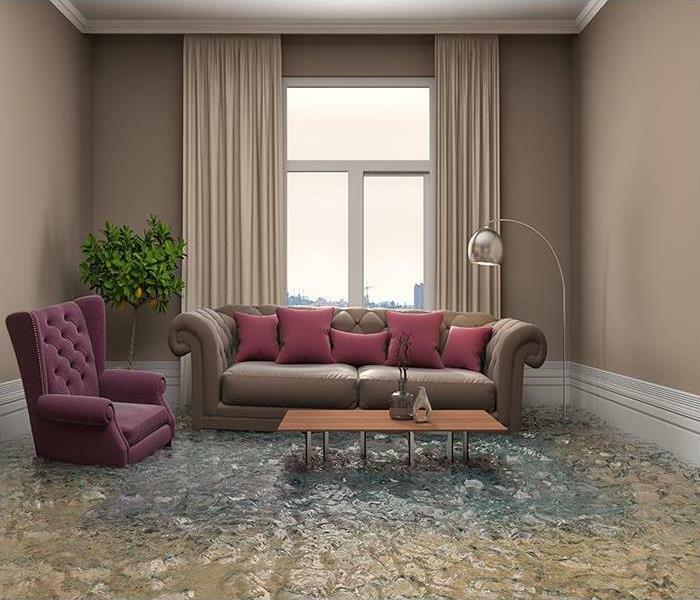 Call us at (931) 388-4248, so we can help mitigate water damage and protect your home. Having the convenience of different appliances in your Columbia home makes completing household chores much easier. As long as these appliances continue to run correctly, they do no damage to your home. This is why regular maintenance of appliances becomes crucial to protect both the machines and your home. Leaky appliances can cause water damage to your Columbia home. This damage can come from ongoing drips underneath the water heater, or from a water line that comes loose, resulting in hundreds or thousands of gallons of water to soak the property. SERVPRO technicians are always ready to help you in either of these situations. Because any amount of water can cause serious and costly damage to your house, SERVPRO specialists are always Faster to Any Size Disaster. The more quickly we respond and start with mitigation and restoration work, the less damage occurs to the immediate and adjacent areas. Before removing the water from your home, we always ensure that the source or sources no longer pose a problem by shutting them off. In the rare situation that we need a plumber for more complicated situations, we have certified and licensed plumbing professionals we partner with, to make the process smoother and less costly for our customers. When called for, we have large capacity truck-mounted pumps that can quickly rid your home of any standing water. For smaller spills, we use heat and air movers that force water into the air by turning it into water vapor. Our desiccant machines can then extract it from the air. We are experts at scaling our equipment to the customer's exact needs, reducing the time required to complete the job. We check with our high-precision moisture meters to ensure once-wet or damp areas become dry, even those that feel dry when touched. Moisture can remain encased inside materials like drywall, only to cause problems later. Other equipment, such as our infrared devices, detects moisture, giving us the knowledge of how far water spread at the beginning of our work. Many times, what seems dry on the other side of a room holds hidden moisture that we can easily eliminate along with the water closer to the area that caused the problem. 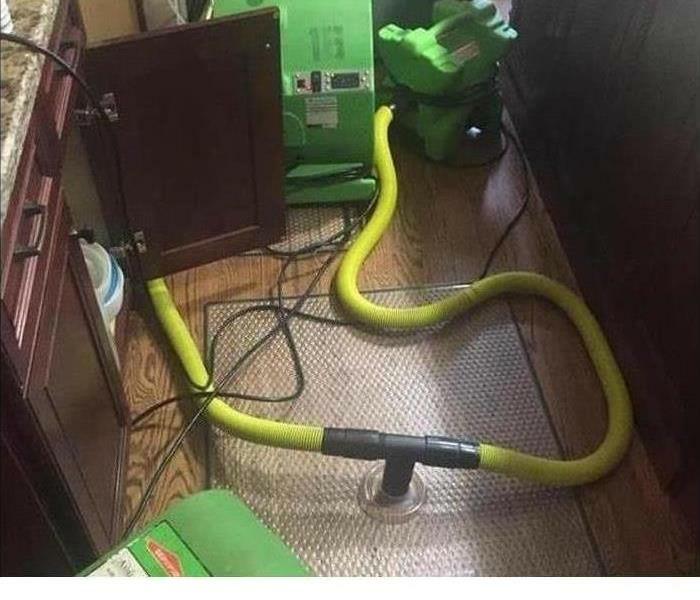 SERVPRO of Maury / Giles Counties is ready to help make your home in Lynnville and Pulaski “Like it never even happened.” Call us at (931) 388-4248, so we can help mitigate water damage and protect your home. If you ever need moisture extracted from your home, call SERVPRO of Maury / Giles Counties at (931) 388-4248 any day of the week. If excessive moisture ever happens to find its way into your Columbia home, it is wise to call in the professionals. Our highly trained team at SERVPRO is experienced in working with water cleanup projects both big and small. During any moisture-related damage scenario, it is easier to remove moisture while it is in liquid form. We know that the more liquid H2O we can extract the quicker the drying process will be. We conduct water cleanup quickly by using advanced technology and industrial extraction equipment. Whenever moisture gets inside your dwelling, the problems get worse the longer items inside your home stay wet. Conducting water cleanup in Columbia quickly can help prevent secondary damage like humidity and mold issues. Once materials inside a house get wet, the humidity levels rise which can cause problems with items that didn't come into direct contact with moisture. Humidity levels can also create an environment that is ideal for fungal growth. All mold needs is an organic food source like paper or wood, moisture, the correct temperature, and time. 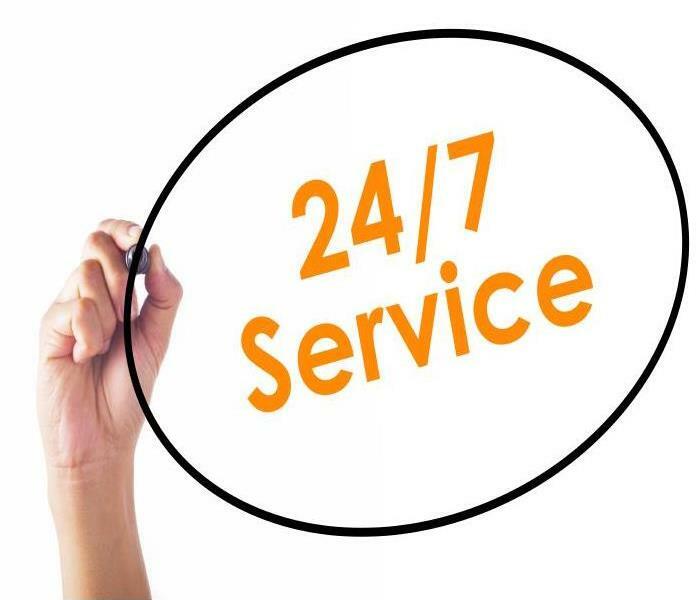 Since problems can get much worse over time, our SERVPRO team provides fast 24/7 service. We are available all of the time to answer the phone and arrive at your residence promptly. As soon as our IICRC certified technicians arrive they set up equipment and begin extraction. Depending on what inside your home gets wet our SERVPRO technicians can use different types of extraction tools and vacuums. The advanced technology our experts have at their disposal allows us to use a combination of specialized extractors and tools to pull out moisture. For example, we can use a portable extractor and a small handheld water claw tool to get into tight spots. If your carpet gets saturated, then we can utilize a truck-mounted extractor and a heavy-duty weighted extraction tool that compresses your carpet to pull out as much water as possible. When water loss incidents threaten your coffee shop, even isolated events like considerable spills can spread too quickly for your staff to keep up with and manage. The last thing that your shop needs is mold growth that shuts down your business until the appropriate personnel and inspectors can affirm that you are safe to rejoin the food and beverage industry. It is wise to reach out to professional restoration technicians like ours to help you limit loss and return the property to its original condition fast, whenever possible. 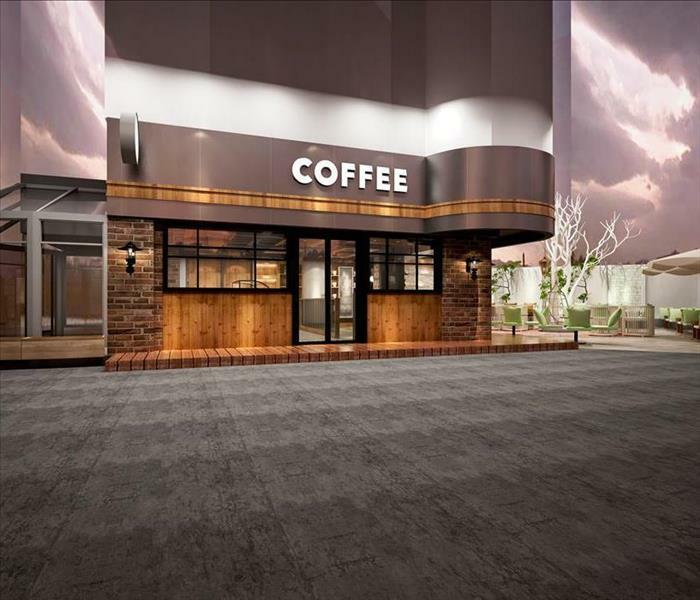 As the owner of the coffee shop in Spring Hill, you have many concerns that follow your need for water removal in the building. The first of these is all of the structures and woodwork that make up your counters, storage, and flooring. Our SERVPRO professionals have drying equipment that can keep these elements safe from necessary tear out and reconstruction if we get notified of the emergency quickly enough. With water removal, extraction is the vital element that ensures that our technicians can begin the necessary restoration work as promptly as possible. We arrive with many different tools for this step, including gas-powered pumps, extraction wands with wet-vacs, and even portable electric sump pumps that can run off of generators we provide if your building has lost power. Restoring elements like hardwood flooring, even high-quality laminates intended to look like hardwood, is often an intricate process. 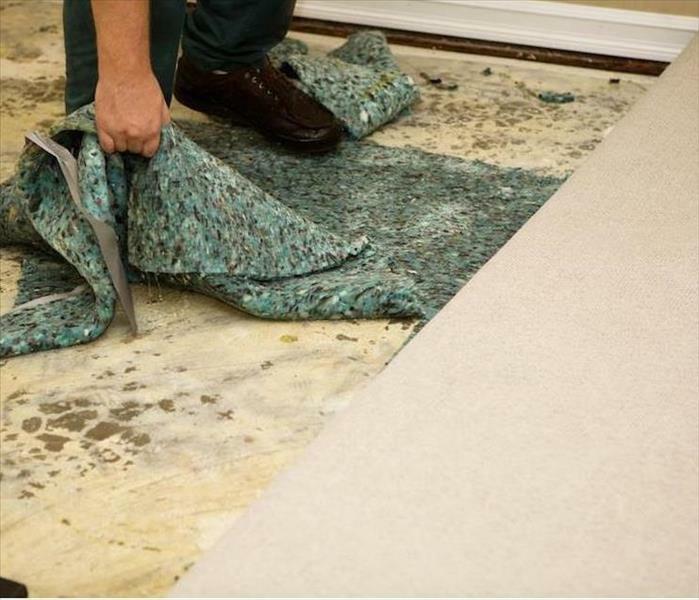 For preventing the excessive drying of these materials, our SERVPRO team installs large drying mats to slowly draw moisture out of the seams and planks until the desired moisture level gets reached. Overly drying materials like wood flooring can cause as many damages as allowing them to become oversaturated and distort. Protecting your business after a water loss incident does not have to be complicated when you reach out to the right professional team. 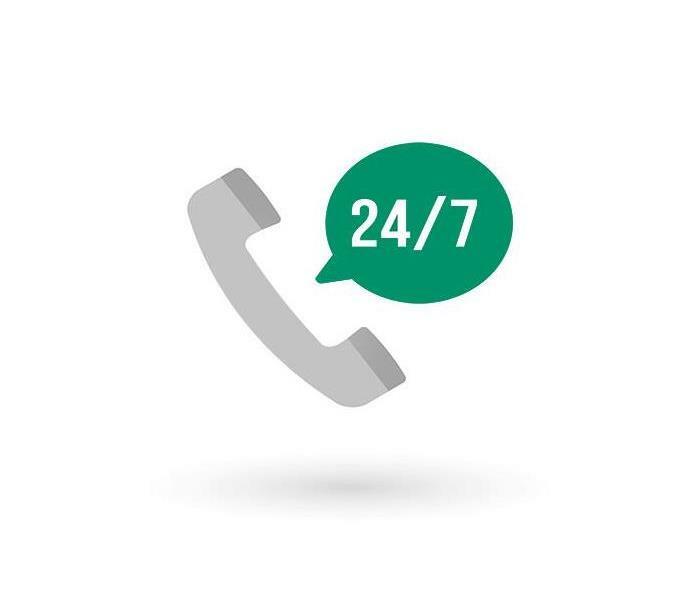 Our SERVPRO of Maury / Giles Counties technicians are standing by to help, 24/7, at (931) 388-4248. Natural disasters like flooding present several unique risks to your Columbia home and those that live inside it. Preventing these disasters can often be impossible, especially when conditions get met for creeks and streams around your home to rise beyond their banks and affect entire communities at once. The only choice that you have is to work as quickly as you can to get the right personnel to your property to begin mitigation work and the necessary steps to minimize the length and cost of time it takes to restore the damage occurring. While you might have numerous concerns when floodwaters penetrate your Columbia home, the most pressing of these is removing the pooling water from the exposed areas of your property as promptly as possible. The longer that floodwater rests against materials and contents of your home, the greater the risk of contamination, bacterial growth, mold growth, and other biohazardous effects to occur. Our SERVPRO professionals are available 24/7 to respond quickly amid an emergency with extraction strategies that work. Depending on the seriousness of the damage, our technicians might use one of several different types of extraction equipment to remove the excess water from your property. For severe situations, we offer truck-mounted pumps along with our SERVPRO Green Fleet of response vehicles to quickly remove this threat at a rate of 300 psi. Additionally, tools like our extraction wands, portable sump pumps, and weighted extractors can help to pull moisture away from vital structural components. Removing the excess water from exposed areas of your property is important to allow the drying efforts to follow to happen quickly. Materials like drywall and carpeting must get removed from flood-damaged properties, but effective drying of structural elements like framing, studs, and beams can help to ensure that reconstruction takes less time and is less expensive overall. While there are many concerns that a homeowner has when floodwaters begin to breach their property, the first reaction that you should have is to reach out to our SERVPRO of Maury / Giles Counties rapid response team. With our experience and industry-leading equipment, we can make flood damage “Like it never even happened.” Give our crew a call 24/7 at (931) 388-4248.
Who Else Wants to Know the Mystery Behind Water Removal in Columbia? When your home carpeting gets wet, drying it fast becomes critical. Contact our certified SERVPRO team to start the job right away. Carpets can be a nice addition to your Columbia home, but they also become a magnet for dust, dirt, and debris that can collect within its fibers. Even more challenging is the presence of water damage, which can saturate carpets and the subflooring material beneath quickly and prove difficult to remove without specialized equipment and expertise. Our professionals can help by responding quickly to water loss incidents to save carpeted areas of your home from irreparable damage. While carpets remain a staple feature for home construction, they can also be a hurdle to overcome when your residence requires professional water removal in Columbia. Our SERVPRO team can respond quickly to emergencies, offering the full measure of our advanced equipment and trained technicians to offer effective mitigation and rapid drying efforts. With the right response to the situation, we can often preserve the material without resorting to replacement. Our team focuses on protecting original materials used in your home’s construction where we can because this saves our customers both time and money. We have efficient extraction equipment designed to work on carpeted areas such as our remote-controlled weighted extraction system called the ROVER. This tool forces water and moisture to the surface of the carpet to get pulled out by the high-powered vacuum system on board. We also can work to dry out the affected areas quickly through the combined use of air movers and dehumidifiers. By pulling up the carpeting around the walls, we can set up this high-powered heat exhaust to blow underneath the carpeting layer to affect the subflooring and material above the air mover simultaneously. These techniques can help to reduce moisture present in these areas fast, which can preserve this material when possible from removal and replacement. While you might enjoy the look and feel of carpeting in your home, water loss incidents can saturate these materials quickly to pose real threats to your house and its occupants. Give our SERVPRO of Maury / Giles Counties rapid response team a call anytime that you need us at (931) 388-4248. Regardless of what room the fire in your home has affected, the air quality of the entire home needs to be addressed. Contact SERVPRO immediately. While many Columbia homeowners tend to fixate on the contents of their home or the structure itself after a fire, one of the gravest concerns for technicians working on the property or occupants of the household is indoor air quality. 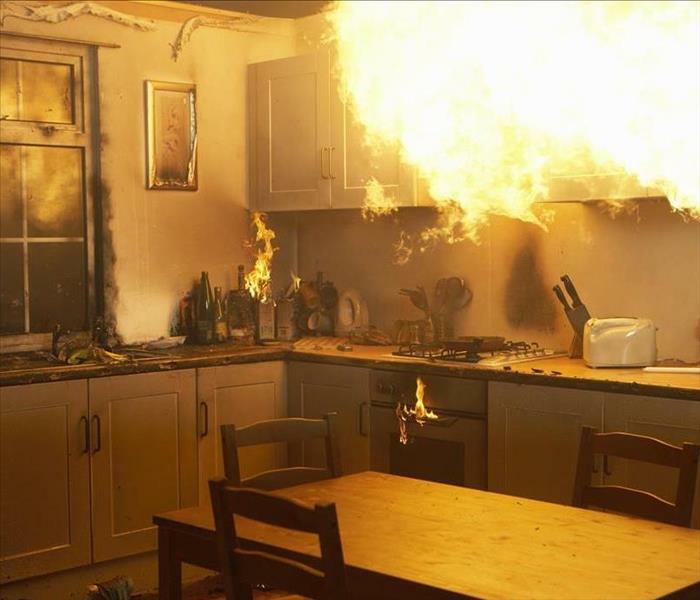 With the varying types of materials that could have burned in the fire, along with chemicals, detergents, plastics, solvents, and other household products, the air inside the home could prove volatile to breathe. Taking care of air quality concerns is one step in how our dedicated professionals restore fire damage in your Columbia home. We strive to offer fast responses to every customer’s emergency, regardless of when it happens. That is why our rapid response team remains available 24/7, including the holidays. We can dispatch the full measure of our SERVPRO Green Fleet to offer effective and comprehensive mitigation and restoration solutions to our customers amid the earliest stages of damage recovery. 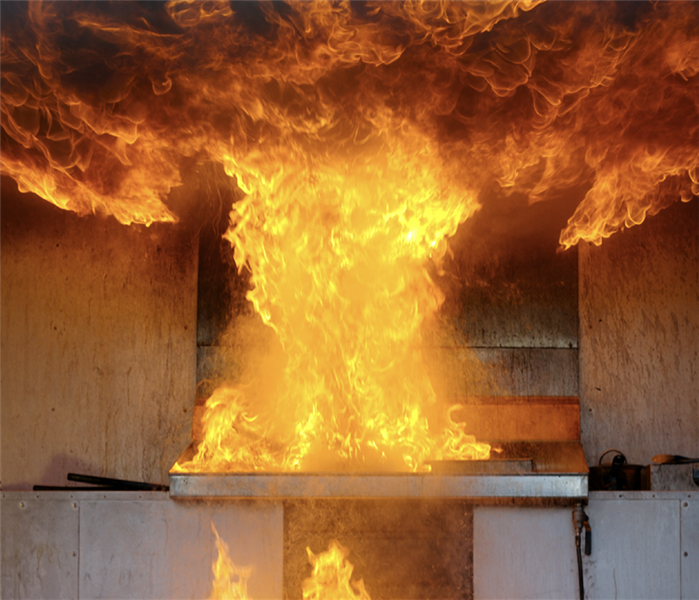 Our professionals have unique and continued training in modern fire restoration techniques, as well as the use of personal protective equipment like SCBA tanks and respirators to effectively remove debris and begin controlled demolition efforts even if the air is not clear of particulates and volatile gases. In-house training and online educational courses beyond our IICRC certifications help to keep potential hazards fresh in the minds of our technicians to approach jobs safely to ensure they get done as efficiently and thoroughly as possible. We also offer homes the full array of our industry-leading equipment to handle all facets of fire restoration. For air quality concerns, we set up machines like hydroxyl generators and air scrubbers to begin pulling soot, smoke residue, dust, debris, and other particulates from the environment while we work. The HEPA filters can catch particles as small as 0.3 microns, making it an effective solution to improve the breathability of the air in your home after a fire has occurred. While air quality is one step towards fire damage recovery, our SERVPRO of Maury / Giles Counties can help you through each phase of the process with efficient and cost-effective techniques. Give us a call anytime at (931) 388-4248. 1/30/2019 - Who Else Wants to Know the Mystery Behind Water Removal in Columbia?